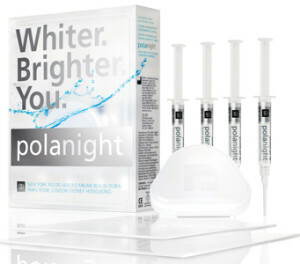 Uk based Happy Smile market the teeth whitening kits made by Pola Night. They are a dental grade home whitening kit comprising Carbamide peroxide whitening gel in a choice of gel strengths, mouth trays and full instructions. Are The Kits Any Good. Without a doubt these kits are really effective at whitening your teeth, the choice of gels is very sensible, for most people we would recommend the 16% strength. With each kit you get 10 syringes of gel (each containing around 5mls ) which is usually sufficient around 40 – 60 treatments, application teeth trays and full instructions. The Happy Smile website is very vague about any guarantees or return and refund policy. They do not appear to have FDA or other official approvals which is a sign that a product has been tried, tested and officially approved. Our other comment would be value for money. At just under £60 for a kit containing 50ml of gel, this works out at around £0.73p per treatment which is quite expensive when compared to others. There are other kits out there that offer exactly the same products as Pola Night but also hold official approvals and also offer much better value for money. One such Kit is the one retailed by UK Based Smile4You. 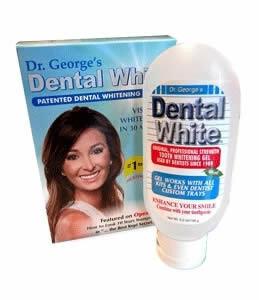 They are the UK’s sole distributor of Dr Georges Dental White, this product from the USA has been established for over 14 years, it has been sold worldwide in its millons, and is the preferred choice of many professional dentists. The kit comprises customisable teeth trays, Carbamide peroxide whitening gel at a sensible 16% strength and full instructions. Where this kit really scores is that you get a massive amount of gel, at 120ml it is the largest quantity of gel supplied by any home kit. With a shelf life of two years, it provides enough gel for up to 240 treatments. Find Out More About Dr Georges Dental White.